SCVHistory.com LW3271 | Saugus Speedway | Actor Leo Carillo at Hoot Gibson's Home (Bonelli House), Saugus Rodeo, 4-28-1935. When Bill Bonelli bought the rodeo grounds in 1939, the home became known as the Bonelli House (or Bonelli Ranch House), and the rodeo was called Bonelli Stadium, later Saugus Speedway. Auto racing was added in the 1940s. Bonelli's heirs razed the 5,600-square-foot adobe ranch house in February 1988, seven weeks after Santa Clarita became a city, for fear the new city would try to force them to preserve it. In truth, however, it would be another 20 years before the city adopted its first historic preservation ordinance, and it was quickly modified such that it protected only eight (8) properties outside of Heritage Junction-Hart Park, all in Newhall. Saugus, Calif. — Hard riding cowboys, steer ropers and bull-doggers were among the features at yesterday's Hoot Gibson rodeo near Saugus. Spills and thrills were the order of the day. More than 20,000 spectators, including many of the film colony, attended the event. 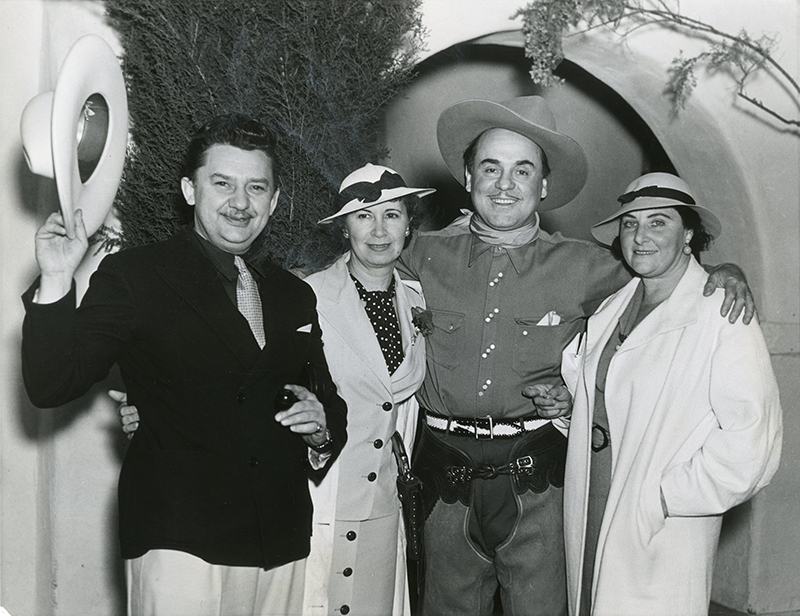 Photo shows: Left to right: Jean Hersholt, (motion picture) actor; Mrs. Jean Hersholt, wife of the actor; Leo Carillo, (motion picture) actor; and Mrs. Leo Carillo, wife of the actor. 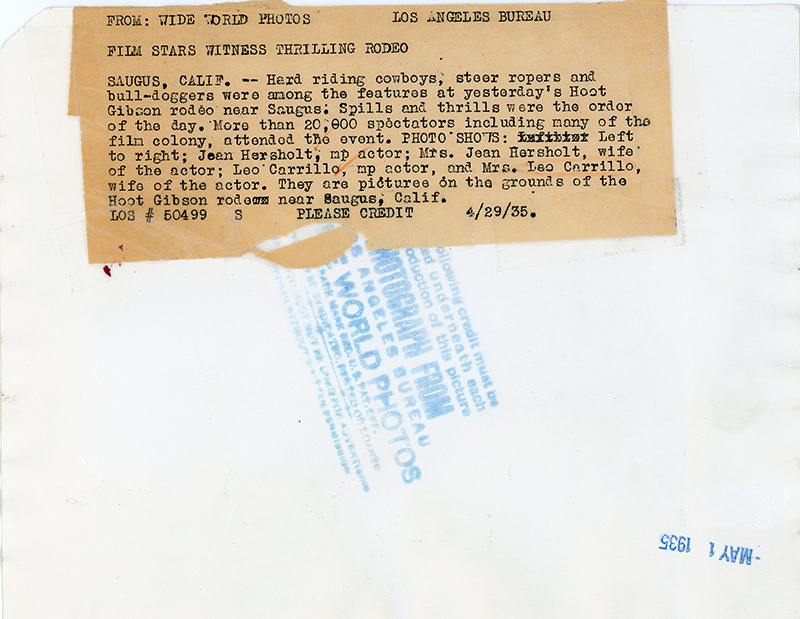 They are pictured on the grounds of the Hoot Gibson rodeo near Saugus, Calif.
LOS #50499 S Please Credit 4/29/35. Leo Carillo (1881-1961), who descends from an old Spanish California family, was best known for his appearance in the Wallace Beery vehicle, "20 Mule Team" (1940), and for his co-starring role as Pancho in all 157 episodes of the 1950s television series, "The Cisco Kid." A state park and beach in California are named for him. Note: He used the Castillian pronunciation for his name — "ca-reel-yo" ("careeliyo") — not the Mexican pronunciation, "carEEo." Hersholt (1856-1956) was an actor who made the transition from stage to screen and from Denmark to Hollywood. Often typecast as a villain, he appeared in 1921's "The Four Horsemen of the Apocalypse" with Rudolph Valentino and starred in Erich von Stroheim's "Greed" (1924). He appeared on screen into the 1950s (until death). LW3271: 9600 dpi jpeg from original photograph purchased 2018 by Leon Worden.